Above Image: Gartner’s Generation V Quadrant, found via Marketing Charts. This is an interesting notion, but I’d suggest that having a demographic overlay is actually very important. First of all, demographics are how brands develop personas of who they are trying to reach, bucketing all internet contributors into one classification may be too broad. Secondly, within Generation V, demographics influences the different tools they use. For example, youth may be more inclined to participate in Club Penguin, while an older professional may be more inclined to participate in Linkedin or Xing –demographics do matter. We focus on Social Technographics, which is also behavioral yet closely tied to demographics (age, country, gender, etc). “Up to 3 percent of individuals will be creators, providing original content and can be advocates that promote your product and services. Between 3 percent and 10 percent of individuals will be contributors, essentially followers, who add to the conversation, but don’t initiate it. They can recommend products and services as customers move through a buying process, looking for purchasing advice. Between 10 percent and 20 percent of individuals will be opportunists, who can further contributions regarding purchasing decisions. Opportunists can “add value” to a conversation that’s taking place, while walking through a considered purchase. I’ve not read the full report to get the context (but would like to) but his coverage seems to slant the CRM side. I believe it’s important to note that demographics indeed influence behaviors, see this technographic profile tool, and you’ll quickly notice different behaviors, with an increase in adoption from those younger –particularly see the US charts. Gartner’s Analyst Adam Sarner does an excellent article featured in Forbes that lists more, it’s a good read with some very practical recommendations. 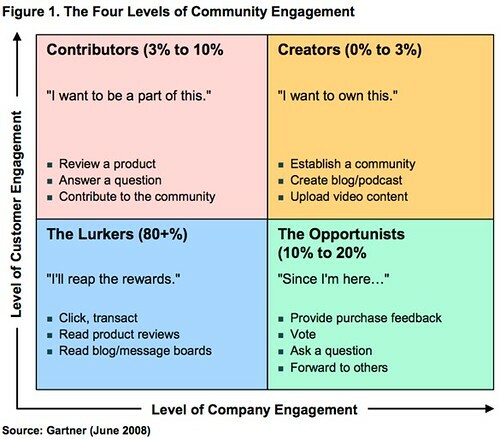 I hope to meet Adam someday (see his Gartner profile), and discuss communities more in detail. In summary, while this breakdown of “Generation V’ is certainly telling of where things are headed, demographics are critical, as behaviors and where they participate will radically differ. As an analyst at Forrester Research primarily covering social networks and communities for interactive marketers, it’s confirmation to hear of other analyst firms discussing my same coverage area. For some, it may seem counter-intuitive for me to discuss about another firm’s work, but it’s important to me that I provide helpful information to my network, regardless of source, and hopefully they’ll continue to trust me and come back to me –even when I send them away. Update: There’s more conversation on Friendfeed. Carter Lusher (analyst watcher) is impressed we can have a civil discussion, why couldn’t we? Also, I’ve made some edits to this blog, post-publication around the area of indicating that our technographics is tied to both behavior and demographics, and discussing how our behaviors (creators, critics, etc) are not mutually exclusive to provide additional explanation.